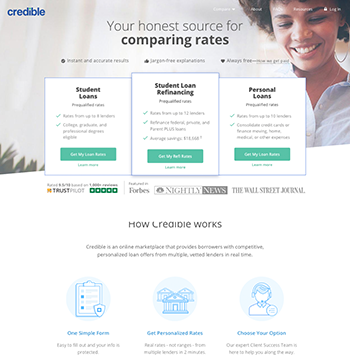 San Francisco-based company Credible is a top rated online loan marketplace that connects borrowers with fair to excellent credit to a network of vetted lenders. Since 2012, Credible's fast and secure marketplace has offered personal loans to consumers with fair to excellent credit scores. Founder and CEO Stephen Dash initially created Credible as a means for borrowers to relieve the burden of student loan debt (they also offer student loan refinancing) but eventually added personal loans to their list of services. Personal loans offered through Credible's partner lenders can be used to consolidate credit card debt, renovate your home, or fund a personal expense like a wedding or vacation. You can receive real, personalized offers from up to 11 lenders in just 2 minutes by filling out a single online form, which saves you time and allows you to compare rates easily. Credible will authorize a soft credit check (which does not affect your credit score) to confirm your financial information. They can do this quickly since they work with the three major credit bureaus (Experian, Equifax, and TransUnion). If you pre-qualify, you will be shown several loan offers by Credible's vetted lenders. At this point, you can choose a loan and fill out a full application through your actual lender. Keep in mind that you are under no obligation to follow through with any of your loan offers and that prequalifying does not guarantee that you will ultimately receive a loan. Your loan terms -- interest rates, repayment terms, and more -- depend greatly on your credit history. Credible's client support team will keep in touch with you through the entire loan application process. Customers can contact them through phone, email, or website chat functionality to speak directly with a representative. $200 Best Rate Guarantee: Credible is so confident in the personal loans rates offered through their site that if you find a better personal loan rate on another lender marketplace, Credible will give you $200 (terms apply). Accredited and top rated service: Credible is BBB accredited with an A+. As of March 2019, Credible is rated a 9.5 out of 10 on TrustPilot (a 3rd party review site) with over 2000 customer reviews. No fees: Credible's service is completely 100% free to use. Simple 2-minute form: Borrowers can receive approval from lenders in a matter of minutes. Large loan marketplace: Credible has a large network of vetted lenders that you can reach simply by filling out one form. This allows you to look through several options before deciding on the best loan for you. Great customer service: Credible's customer service has representatives available by phone, email, or online chat. Credible customers complained that once they chose a prequalified offer and submitted their personal information, they were contacted frequently with phone calls and emails by Credible (not the lenders). Although Credible does not charge any fees for their services, your lender may charge additional fees (such as origination fees, processing fees, and ACH transfer fees). Be sure to read the terms and conditions carefully before signing any documents. Credible is a 100% free to use loan comparison service. Credible's lending partners offer loans between $1,000 and $100,000. Fixed rates range from 5.99% to 35.99%. Loan terms range from 2 to 7 years. Will comparing financial products through Credible hurt my credit score? To provide prequalified rates, Credible simply performs a soft credit inquiry (which does not damage your credit in any way). However, if you decide to proceed with a selected lender, that lender may perform a hard credit inquiry. How does Credible make money if it's a free service? Credible is a completely free service for consumers, but they are paid a commission by their partners for referring borrowers.